The first two points are labeled on the map. On the map, the user can click on the button with the calligraphic letter "i" to read the length of the sides of the polygon (distance between two adjacent points), and the angle of the vertices. The table shows some information about the acquired points. 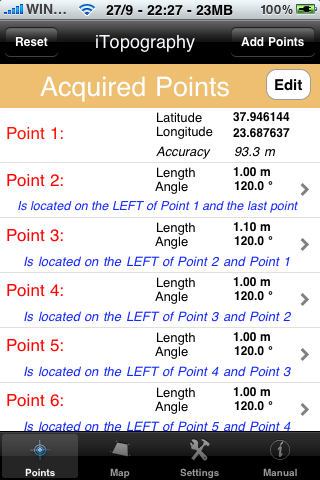 In total, six points were acquired, among which the first point was acquired with the GPS device. and the other points were manually given; We gave the length of each side of the polygon and the vertex angle. So, the side of the polygon that would connect the 2nd with the 3rd point is 1.10m and the angle of the second vertex is 120o. iTopography calculated the coordinates (x,y) of the six points and it drew the surface. At the top of screen we read the area of the surface and the perimeter. Also, the first two points are labeled to help us in labeling the rest of the points. Did you notice the icon with the calligraphic letter "i" on the top right corner? If you press on that icon you see a table that shows the distance between two adjacents points (i.e., the length of each side of the polygon). 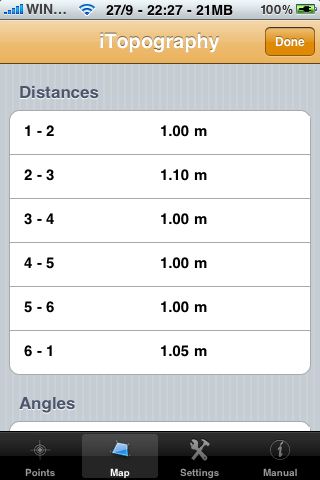 Note that the distances are exactly equal to what we set them to be. Here we see the angle of all the vertices in the polygon. 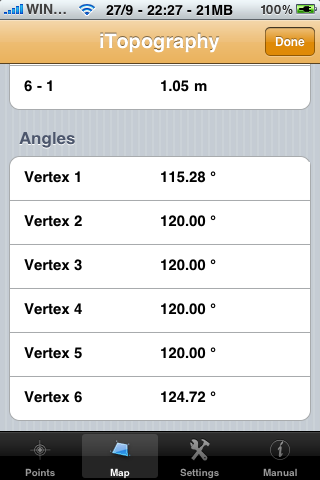 Notice, that although we wanted the angle of all vertices in the polygon to be equal to 120o, they are not!! 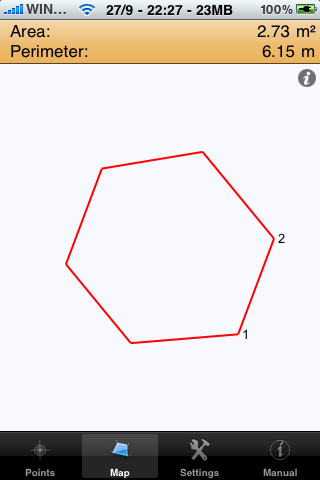 This is because, the polygon is not a regular hexagon, as all sides do not have the same length. Although there is a mismatch between the vertices angle and the length of the sides of the polygon, iTopography was capable of computing the coordinates of these points.